Now for this week's Short & Sweet Saturday card. This week, I'm using a Sale-A-Bration (SAB) stamp set from the second release that I haven't had a chance to use until now. Its called Eclectic Expressions. 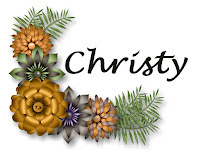 It has two greetings, some great circles, watercolor brushstroke stamps and more. It's a Level One Stamp set, so you can get it FREE with a $50 order (before shipping & tax). I also used the Scattered Sequins Dynamic Textured Impressions Embossing Folder. There are two ways to get it. You can choose it as your FREE SAB item when you place a $50 order (before shipping & tax), or you can purchase it. I've included both options (they have different item #s) below in the supply list. 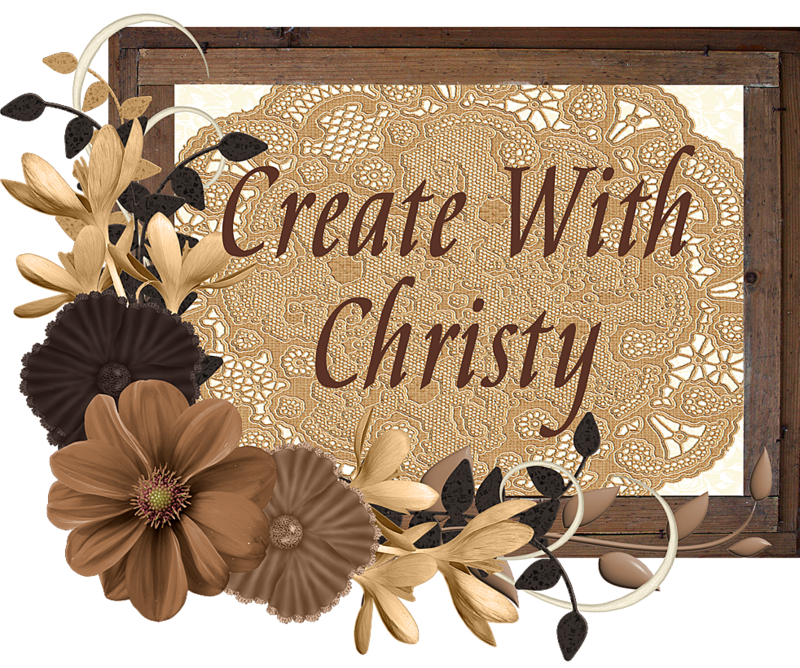 If you don't see the supply list, you'll need to go to the actual post on my Create With Christy blog. You'll have to hurry! SALE-A-BRATION ENDS NEXT SATURDAY! Only one more week, guys! 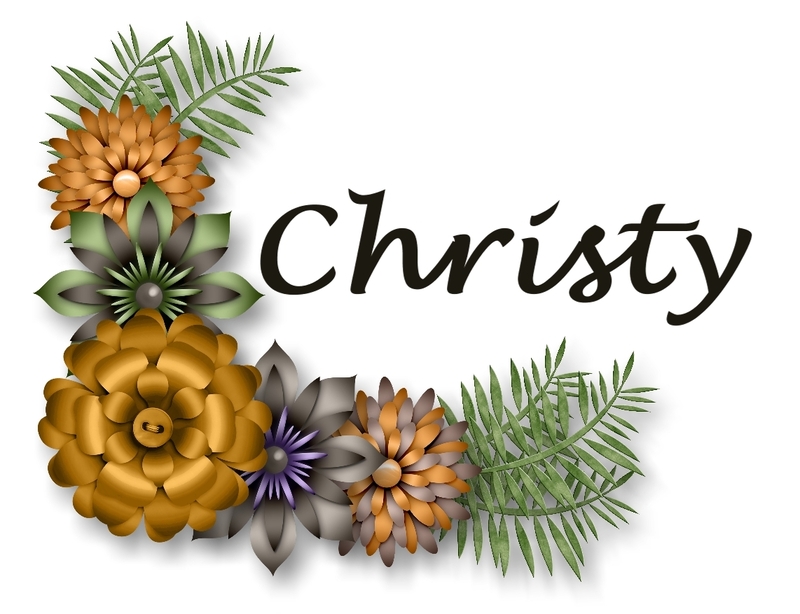 I'm also using the Berry Burst 3/8" Metallic-Edge Ribbon from the Occasions Catalog. 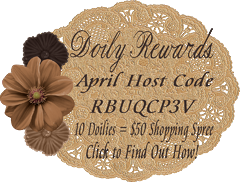 This is my customer give-away for this month with a qualifying order. You can only get it FREE from me, but you'll have to hurry...MY EXCLUSIVE, FREE OFFER ENDS NEXT SATURDAY, TOO! If you place a March Customer Give-Away qualifying order, you'll not only be able to get the Berry Burst Metallic-Edge Ribbon FREE from ME, you'll also be able to choose the Eclectic Expressions Stamp Set or the Scattered Sequins Embossing Folder as your FREE SAB item! 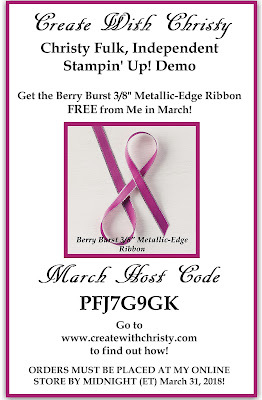 Click Here To Find Out How to Get the Beautiful Berry Burst 3/8" Metallic-Edge Ribbon Free From Me (Plus this Month's Card) This Month! Picture Perfect Party Designer Series Paper (DSP): 4" x 3/4"
Berry Burst 3/8" Metallic-Edge Ribbon: 5"
Emboss the largest Whisper White piece by running it through the Big Shot with the Scattered Sequins Dynamic Textured Impressions Embossing Folder. Attach the Picture Perfect Party DSP piece across the lower part of the embossed piece. Attaching the left end of the Berry Burst Metallic-Edge Ribbon to the back of the embossed piece, attach the ribbon across the top of the DSP, trimming the right end of the ribbon at an angle (see picture). Attach the piece to the center of the Peekaboo Peach piece. Fold the Pool Party piece in half (fold on the left) to form the card base. Attach the piece from Step 1 onto the center of the card front. Die-cut a circle out of the smallest Whisper White piece using the second, largest circle die from the Stitched Shapes Framelits Dies. Stamp the "Happy Birthday" stamp from the Eclectic Expressions Stamp Set onto the center of the circle using the Berry Burst Classic Stampin' Pad. Stamp the largest, watercolor brushstroke stamp across the center of the "Happy Birthday" using the Lemon Lime Twist Classic Stampin' Pad. Stamp the smallest, watercolor brushstroke stamp onto each end of the "Happy Birthday" using the Peekaboo Peach Classic Stampin' Pad. 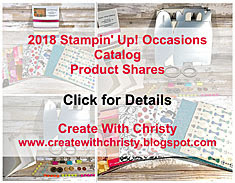 Stamp the large circle stamp around three times onto the piece using the Pool Party Classic Stampin' Pad. 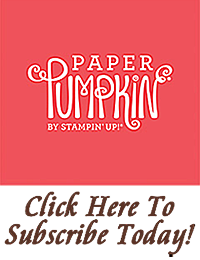 Stamp the dotted-circle stamp around three times onto the piece using the Bermuda Bay Classic Stampin' Pad. Stamp the dotted stamp a few times onto the piece using the Peekaboo Peach ink pad. With the circle turned over, stamped-side down, put SNAIL Adhesive across a wide area across the middle of circle. Attach an end of Silver Metallic Thread onto the adhesive on the back of the circle. Start making loops with the thread so there are 3-4 loops showing on the bottom, left of the circle, and 3-4 loops on the top, right of the circle. Cut the thread off of the spool, and attach this end to the back of the circle (see picture). Die-cut a scallop circle out of the Berry Burst piece using the third, largest scallop circle die from the Layering Circles Framelits Dies. Attach the stamped circle to the center of the scallop circle. Attach a Berry Burst binder clip from the Birthday Mini Binder Clips to the top, left of the circle. Fold the back handle of the binder clip down so it's up against the back of the scallop circle. Attach the scallop circle to the left, side of the card using Stampin' Dimensionals (see picture). Put sequins from the Tutti-Frutti Adhesive-Backed Sequins all over the section above the ribbon.